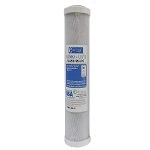 KX Matrikx whole house filter cartridges offer whole home water filtration of chlorine. KX Matrikx water filters are made in the USA. The KX Matrikx +CTO/2 Carbon Block Filter # 32-250-125-20 is NSF tested and Certified to reduce Chlorine Taste & Odor from your drinking water. Also known as The Workhorse. 20" Filter.